January 31: The Executive Committee of Habitat for Humanity International’s board fires Millard and Linda Fuller after Millard served 29 years as President and CEO. 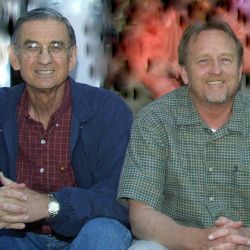 February: The Fullers along with David Snell and Ken Hensen start a new housing ministry based on original biblical principles and grass-roots methods developed at Koinonia and in Africa in the 1970s. April: First board meeting held at Koinonia and headquarters in Americus inaugurated. First Covenant Partner group formed in Suffolk, Va.
May: The Fuller Center for Housing headquarters building renovation completed and dedicated in Americus, Ga. The headquarters is now known as “The Wieland House” in honor of its donors, John and Sue Wieland. July: Work started on building 100 houses in Nepal ($750 per house). Linda Fuller co-authors “Woman to Woman Wisdom: Inspiration for Real Life” with Bettie Youngs and Donna Schuller. September: Fuller Center for Housing Web site launched: www.fullercenter.org. October: “Building on Higher Ground” Initiative launched in Shreveport, La. Official dedication of Points of Light “Extra Mile Pathway” near The White House in Washington, D.C. commemorating Linda and Millard Fuller as founders of Habitat for Humanity International alongside leaders of 19 other well-known organizations such as Martin Luther King, Jr. (Civil Rights Movement), Juliette Lowe (Girl Scouts), William Booth (Salvation Army), Eunice Shriver (Special Olympics). December: Fuller Center’s first three U.S. houses built in Shreveport, La. February: Executives added to FCH staff: David Snell (VP Programs), Glen Barton (Director of U.S. Field Operations). A revolutionary new idea of “Greater Blessing Box” is conceived by Millard Fuller. Based on Jesus’ teaching that it is “more blessed to give than receive”, that blessing should not be denied to those with extremely limited incomes. Homeowners critically needing basic renovations of $5,000 or less would not be legally required to repay. However, a Greater Blessing Box filled with envelopes is given to each homeowner when renovations are complete. They are asked to send whatever they could afford so that they can receive the greater blessing by helping finance renovations for another needy homeowner. From states throughout the nation, dedicated volunteers, some from HFH affiliates, converge in Northwest Louisiana to complete 23 houses with the “Higher Ground” initiative in Shreveport as well as a number of homes renovated on Gulf Coast in partnership with Mennonite Disaster Service. Millard maintains rigorous travel schedule with high profile speeches to People Helping People Network, Indianapolis, Ind. ; National Youth Leaders Conference, Washington, D.C.; YPO Fellowship Conference, Tucson, Ariz.; Gathering of Leaders, Mohonk Retreat Center, N.Y.; Lutheran Social Services Annual Meeting, Marion, Ill.; Episcopal Churchmen 60th Annual Conference, Monteagle, Tenn. and numerous Habitat for Humanity events in more than 20 states. June: “Look What Love Built,” a song about Linda and Millard Fuller, written and sung by Jamie O’Neal, premières on CMT “Unsung Heroes” series. September: Bush-Clinton Katrina Fund selected The Fuller Center for Housing for a $100,000 grant to build two houses for hurricane evacuees. LeRoy Troyer of South Bend, Ind. (former HFHI board member) elected chair of FCH board. First “Millard and Linda Fuller Blitz Build” held in Allendale neighborhood of Shreveport, La. Ten houses were built from foundation up and completed in six days. Most homeowners were Katrina hurricane victims resettling on “higher ground” from the Gulf Coast. Work starts in Nigeria and Sri Lanka. December: Volunteer work teams from a number of locations around the US went to Shreveport, La. at various times to build more houses. January: Lynda Spofford of Lanett, Ala. joins FCH staff as VP of Communications. Millard has 2007 speaking engagements to World Presidents Organization, San Francisco, Calif.; North Carolina State University, Raleigh, N.C.; Affordable Housing Conference, Oklahoma City, Okla.; Annual Cooperative Baptist Fellowship Conference, Little Rock, Ark. ; Renaissance Weekend, Banff, Alberta, Canada; Minneapolis “Building on Higher Ground” Project, Minneapolis, Minn.; International Marriage Enrichment Celebration, Orlando, Fla.; Gateway Business Alliance, Indianapolis, Ind. ; Southwestern Washington Synod of Evangelical Lutheran Church in America, Wa. ; “101 Powerful Women…and a Few Good Men” Conference, San Diego, Calif. and National Missionary Conference, Cincinnati, OH. March: Kick-off for Chattahoochee Fuller Center Project Initiative with 500-house goal to eliminate poverty housing in West Point, Ga. and Lanett, Ala. FCH adds covenant partners also in Illinois and South Carolina and in the nations of El Salvador and Democratic Republic of Congo. April: Millard Fuller’s 10th book, “Building Materials for Life – Volume III” published. July: 40 volunteers, led by Jeff Cardwell of Indianapolis, travel to El Salvador to build four houses in a week to launch the work of The Fuller Center in that Latin American country. First phase of work in El Salvador is 100 houses. September: Second Annual Linda and Millard Fuller Blitz Build held in Shreveport, La. Nine new houses and five renovations completed. 25 FCH houses completed in Nigeria. October: Release of “The House That Love Built: The Story of Linda and Millard Fuller,” Founders of Habitat for Humanity and The Fuller Center for Housing. November: First Student Builders group started at Harvard University. FCH in 15 states and six other countries. April: Earth Day Blitz Build in West Virginia (HFH affiliate and FCH covenant partner join forces for event. Four new programs added for group-specific involvement with FCH: Faith Builders, Global Builders, RV Builders and Disaster ReBuilders. First BIKE ADVENTURE covers 3,300 miles from San Diego to Savannah, led by Ryan Iafigliola.